Hi, I’m Matt, Chief Architect at DVLA and responsible for setting the agency’s technical direction. 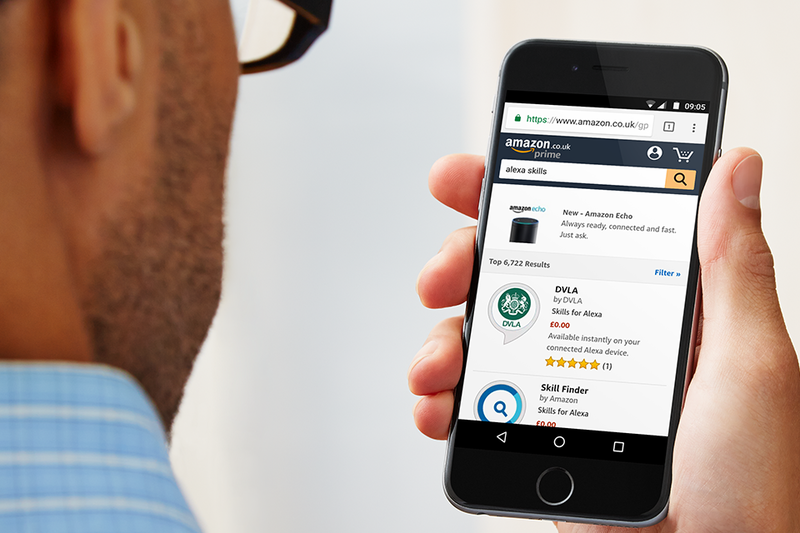 Last year I was thrilled when we released our first Alexa skill on the Amazon store which lets you check when your vehicle tax and MOT is due, 24 hours a day, 365 days a year. Moving into voice computing has allowed us to trial this innovative DVLA Alexa skill on Amazon, and given our customers more choice in how they get information about their vehicles. Our skill allows you to tell Alexa a registration number and hear back when the tax and MOT is due for a vehicle. These details are also returned as a card in the Alexa app. Alexa has also helped raise awareness of a vehicle’s status so it gets taxed and on the road as simply, safely and efficiently as possible. We’ve had some great feedback and our analytics show the majority of registration numbers are understood first time. Enable the skill in the Alexa companion app, this will bring up a new screen. Type in up to 3 registration numbers, saved as part of the skill. Ask Alexa when your tax is due. You no longer need to read out your registration number each time. If you want to check a number that isn’t saved just ask Alexa to check a new registration number. I really look forward to receiving the feedback from the update to the skill. I’ve already learnt that there is an appetite for using voice services to interact with DVLA and I’m really excited to know what you think of the service. I built the skill at home, showed people the working skill as a demo, and gained the full support of DVLA’s Executive Board to publish it. It’s fantastic to work for an organisation that embraces innovation, and is prepared to support new ideas like this. I’ve received nothing but encouragement along the way. Want to work on interesting technical challenges on services that touch over 90% of the UK adult population? Very good works fine Great idea. Using methods such as this are just another way to ensure vehicles are taxed and insured. Every method possible should be used to ensure this an I’m glad the DVLA is embracing modern technology. It also reduces costs. Good on yer! Is this available on google assistant please? we are looking at extending this to Google Assistant in the near future. We'll update you on this blog so watch this space. available on google assistant please? Our move into Voice Computing has been carried out as a trial, and we’ve been delighted with the results to date. We chose Alexa as the market leader, but we are looking at extending this to Google Assistant in the near future. We are not actively looking at Siri at this time. The Alexa app for Android devices allows you to use Alexa on an Android device, with an iOS version due soon. The Google Assistant app is already available on iPhone and iPad. This is a rapidly evolving area, and we’re excited to see what new opportunities open up. Good on you sir well done. We are looking at extending this to Google Assistant in the near future. We're excited to see what new opportunities open up. I'll be providing further updates on this blog. Not so good for IOS. Are there any plans ??? We're not actively looking at Siri at this time. The Alexa app for Android devices allows you to use Alexa on an Android device, with an iOS version due soon. The Google Assistant app is already available on iPhone and iPad. This is a rapidly evolving area, and we’re excited to see what new opportunities open up. I'll be providing updates on this blog. This is down to customer feedback. The assumption was storing up to 3 registration numbers would support the vast majority of users of the skill. If there is a demand to increase this, we will definitely look to do so. Can Alexa give you reminders about tax and not? One month before a week before , on the day and pester thereafter? Is the API to perform the lookup readily and freely available to other developers?